A while back, SJ over at Snobbery won a contest here on Sappho’s Torque, and her reward was to have a guest blogger spot. This week we’re featuring her post, a book review of a novel my rising-9th-grade niece is currently enjoying. I hope you enjoy her review! Be sure to check SJ out on her blog and on Twitter and on Facebook. Super delightful stuff. And just as a quick reminder, you still have four days left to enter the Chindogu Challenge. 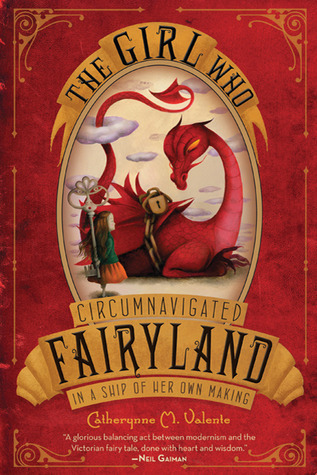 Recently I read Catherynne Valente’s The Girl Who Circumnavigated Fairyland in a Ship of Her Own Making – I know, I know, just the name is a mouthful, right? – a book I fully expected to love. Look, I loved the IDEA behind this book, but I felt it was a little lacking in execution. I was expecting something of a faerie tale version of Clive Barker’s The Thief of Always (which I have read and re-read because it succeeds where I think this book fails) – a book for younger readers (if I MUST pin a YA label on it, I will) that parents and adults can enjoy as well. What I found, though, was a book that read as if it were geared towards adults either attempting to regain that childlike sense of whimsy, or reminisce about those fantastic books they read as children. Don’t get me wrong, there was a lot about this book that I think was done right – but I can’t imagine any children I know being particularly interested in it. I know (for example) that if I handed this book to my almost 13-year-old (who loves faerie stories, btw – he’s my son, after all), he would probably read about 10 pages before handing it back to me and saying, “Nah. Can I go read some more Barsoom?” …or A Series of Unfortunate Events, or The Looking Glass Wars, or whatever else it is that he’s into at that point in time. This is a book that is marketed as being for children, but when I read it, it seemed like it was clearly written for adults. That bothered me, and is why I have to append the “ish” to my answer of whether I liked it or not. Well, that’s a lot more fun to talk about! First of all, there are some absolutely delightful illustrations by Spanish artist Ana Juan, they were a lot of fun to come across, and each one made me smile. 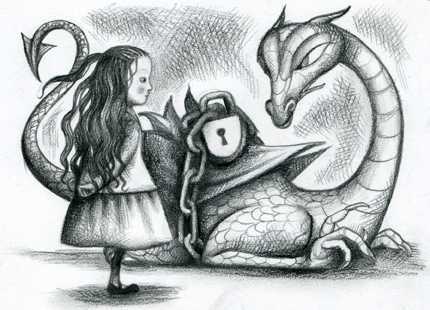 The fantastic characters we meet in Fairyland were wonderfully realized. I cared about them all, especially the Wyverary. What’s a Wyverary? Simple! It’s a wyvern whose father was a library! I appreciated the slightly dense/flowery prose, but that’s another reason I think younger readers might have problems with it. It really read like it was a faerie story I would have enjoyed when I was younger, but it was a little…more, I think. Like I said – some adults will squeal over it, but children will probably just stare blankly. Final verdict? If you’re an adult that still loves faerie tales, this book will probably scratch an itch you didn’t even know you had. If you’re not…you should probably skip it, as you’ll likely find it a bit too twee. Hee, if your teen niece is enjoying it, I guess my assessment was a little off. Oops. Not at all! 🙂 Totally different demographic. She’s about 13. This sounds like a really good book–for me, for sure! I love the Wyverary–it kind of reminds me of the fun I had when reading The Phantom Tollbooth as a kid! Adding it to my TBR now! I loved The Phantom Tollbooth, too! Did you hear Norton Juster’s interview on Wait, Wait, Don’t Tell Me… recently? At least I think it was WWDTM. It might have been another NPR show, but the interview was really funny and not terribly long, so probably not. Yeah, that probably was WWDTM, which is a show I love when I listen to it. But, I didn’t hear Juster on there recently, as I think the last time I listened, it was when Neil Gaiman was on there! I guess that I don’t do much driving on Saturdays! I did get a chance to attend a reading by Juster in college though. Come to think of it, that was the first time I had ever been to an author event. He was very good! Yeah, this interview was just in the last couple of weeks. I remember when Neil Gaiman was on there some months back. That was excellent! Was that around the time when Prince William and Kate Middleton were getting married? I thought they’d asked him some questions about them or something. Yep! That was the one! It HAS been awhile! Mandy, it did have kind of a Phantom Tollbooth feel to it. I gave it 4/5 stars because I really did like it, I just think it might not have been marketed so well. Oh my gosh! The illustrations are delightful! I have reserved Barker’s book at my library. I’ll consider this one, too. Thanks for the recommendation! I know, the illustrations are great. I really enjoyed the book trailer, too. I wonder whether I’d have liked it at that age? In those years I was devouring Jane Austen and Louis May Alcott, so maybe.